Budgets, a frequently used tool, have been around for a long time. Operating budgets seem to be the most common. Although seldom used to their potential, operating budgets are ordinarily among the first budgets attempted. The numbers for these budgets are not difficult to obtain, and most managers will give at least some credence to their usefulness. Cash budgets are not greatly different from operating budgets in their preparation and use. In cash budgeting, attention is focused on the receipt and expenditure of cash. However, cash budgets often are limited to use by fewer people within a business and often are not formalized until required by shortages of cash or the high cost of maintaining cash reserves. In periods of better financial conditions, the inefficiency of having too much cash often is overlooked. As a result, cash budgets sometimes fall into disuse during periods of prosperity. Capital budgeting, however, does not fare well with many businesspeople. This is due in part to the difficulties of preparing a capital budget. Estimates of cash flows must be pushed farther into the future and unfamiliar terms, such as weighted average cost of capital and internal rate of return, creep into the terminology. The calculations associated with these terms are often unfamiliar; many businesspeople have learned to operate with no formal capital budget. However, used properly, a capital budgeting process can help to reduce the risk of making the wrong decision. Capital budgeting is useful as a decision tool. Accountants, and some of your staff and some managers, probably have been trained to make the calculations necessary for determinations of present Investing in values, internal rates of return, and payback periods. The critical work is the gathering of the information necessary to make the capital budgeting process more understandable and useful to the business. They all go through similar stages: conception, birth, growth, maturity, decline, and ultimately death. Each stage requires a certain degree of attention. The applicability of capital budgeting concepts to new projects or new products extends beyond application to new ventures. It can be used to consider the replacement of existing product lines and even to cost reductions in existing lines in the current or future periods. Four basic sets of actions occur in a capital budgeting plan: (1) proposal solicitation or generation, (2) evaluation, (3) implementation, and (4) follow up. We shall examine each in some detail. The first step in proposal generation is evaluation of your present status. Many factors should be considered when making an evaluation of status. It is particularly important to pay attention to your position with respect to the availability of management talent, technological talent, financial and market positions, sources of labor, and the availability of markets for your product. Example: Assume you manufacture heavy cast-iron cylinders for which “the market” is located in south-eastern-un-belt-states. Therefore, one particularly important factor is the cost of transportation of the product to the ultimate user. At least two alternatives are available: Locate the plant in the area where the product is consumed or acquire manufacturing facilities on low cost transportation networks, such as rail or water. Another option may be to redesign the product. For example, assume you find that you can manufacture the cylinders out of aluminum with the installation of a tooled steel sleeve instead of the cast-iron cylinder. The product now requires different raw materials, different processing and handling, and different packaging and shipping. The new product may change your marketing plans, and a proposal for capital expenditures may result. The questions that you should answer are standard business planning questions: “What do we do best?” and “Where are we going?” These require an evaluation of your business plan. The objectives formulated as a result of these questions may point out potential projects requiring capital expenditures. Decisions relative to capital expenditures may be made at various levels within the organization depending on their size and significance. Rules for decision making should be in Long-Term Assets and Capital Budgeting consistently applied at whatever level of management you have established. Cost reduction programs may be a rich source of capital budgeting projects. Cost reduction programs generally carry with them less risk than any other form of project, because they have obvious cost justifications. Potential payback periods and returns on investments can be calculated readily because the programs are intended to improve the cost efficiency of existing projects. Such programs, if adopted, help make employees feel that they are a part of the decision-making process, because a large part of these proposals usually are generated from line employees. Ideas from employees and customers are also often low-risk sources for increased profitability. Marketing or sales personnel meet with customers on a regular basis. They should be able to determine current market needs and may assess demands not being met. Often these opportunities can be exploited with little additional cost to you. By taking advantage of unmet market needs head-on, competition can be avoided and you may successfully expand your market presence. To encourage new ideas and market opportunities, you may use either or both of these avenues: (a) Encourage entrepreneurship by allowing self-interest to work for you. Monetary incentive programs for sales staff and other employees are extremely effective in generating growth-producing ideas. (b) Survey customer needs on a regular basis to learn of potential growth possibilities. Competitors are often a good source of potential growth producing ideas. Sometimes it is beneficial to let competitors pioneer certain new products. Letting them take the risks often eliminates these products from your consideration as a result of their lack of profitability or outright product failure. Of course, this gives the competitor a head start on successful ventures. Product matrix analysis sometimes will disclose holes in the market. Often new ideas are available through purchase from independent research and development (R&D) firms or may be generated by your own R&D efforts. Trade shows, conventions, seminars, and publications are good sources of potential ideas. In this case, you are not paying for the development of ideas but instead are picking other people’s brains. You may decide on vertical growth—being your own supplier or marketer. Supplying yourself with components, services, or raw materials is a source of potential profit. Setting up your own distribution network outlets can be profitable as well. For example, some utilities have diversified into fields such as coal production and transportation in order to guarantee a source of supply and to reduce the risk associated with fuel cost variations. In this way, vertical integration provides them with additional revenue-producing sources of unregulated profit. Some natural gas utilities sell gas appliances. Being “the gas company” gives them an entrée for marketing the appliances. Customers trust a company that provides gas to know which are the best gas appliances. You may want to grow horizontally through product diversification or buying of competitors. You can expand the use of current technologies. Constantly ask: “What can we do with what we know or what we do best?” How adaptable is the current technology to meet new product innovation or new processes? The opportunity here is to have growth-producing ideas with minimal risks. If you have learned to utilize your technologies efficiently, further endeavors with known technologies generally carry less risk than ventures into new and yet untried technologies. Expand the use of your existing equipment. In-place equipment may not be fully utilized. Increased utilization through subcontracting and selling of time on equipment or process capabilities will better utilize existing capital resources with little additional risk. More use of the fixed-cost base increases efficiency and at the same time produces additional cash flows. After proposals have been generated, you must evaluate competing proposals in a consistent manner to determine which proposals merit further consideration. There are basically four steps in the evaluation process. The most critical step is a qualitative evaluation: Is this proposal consistent with the strategic plan of the business? If not, no future consideration is necessary. If yes, further analysis is indicated. A lot of time, effort, and money can be wasted on things that do not fit the direction you are determined to go in. Define the evaluation process. Set up a system that will be applied consistently for all proposals: (a)Estimate costs accurately and in the same way for all proposals, (b) Estimate the benefits consistently. (c) Use the same time constraints. (d) Use the same method for calculating the net benefits. Qualify your information sources. When gathering information, you must evaluate the reliability and accuracy of the source of the information. For example: (a) Engineers often underestimate the time (and costs) necessary, (b) Salespeople frequently overestimate potential sales. You should ask: (a) Who is providing the information? (b) How accurate were their last predictions? (c) How often have I relied on this source before? (d) Do my competitors use this same source? Install the process. To install the process properly, all affected persons must understand how to use it: (a) Develop capital purchase evaluation forms to be used throughout the organization, (b) Explain the forms and the evaluation methods to all affected persons, (c) Use the system consistently to evaluate proposals, (d) Provide prompt responses to applicants as to why their proposals were or were not accepted. In the implementation phase, effective project management requires a firm line of control. First, define responsibility. You need to know who will be responsible at various stages in the proposal’s implementation to ensure accountability and control. It is important to consider the time and the talent of the individuals involved and to match their abilities to the needs and responsibilities of each key position in the implementation process. Few things affect the failure or success of a product more than the match or mismatch of key personnel at critical steps in project implementation. Next, establish checkpoints by setting goals and objectives for milestones at successive stages in the process. Review your decisions regularly, before the next costly step is taken and when progress can be compared with established standards. You may choose to terminate a proposal at some point short of completion if it appears that the project is exceeding cost projections or failing to meet benefit expectations. It may be necessary to change the budget. This may seem a radical idea. However, if budgets are managed properly, changing a budget is nothing more than considering better data as they flow into the system. Budget changing should not become a self-fulfilling prophecy. Budgets are planning tools, and, as such, comparisons between actual performance and projected performance often will show how well or poorly your project is proceeding. Updating budgets for better control is useful in order to improve the quality of decision making for the project. When budgets are used for control, regular feedback of information is needed. The establishment of reports is another critical element in the implementation phase. The amount of reporting is a function of balancing the risk of ignorance against the cost of reporting. When reports are generated on a regular basis, you can ensure maintenance of adequate control of the project. Neglect near the concluding stages of a project can result in unnecessary delays, increased risk, and higher costs for the discontinuation or normal termination of a product’s life cycle. In the follow-up step, you should review the assumptions under which the original project was accepted, determine how well those assumptions have been met, review the evaluation systems that were in place, and, finally, evaluate the implementation of the project. It is at this point that an overall review of a project will show you how well it was planned, how well the budget projected reality, and the necessary areas where improvement in the system will help better evaluate future proposals. 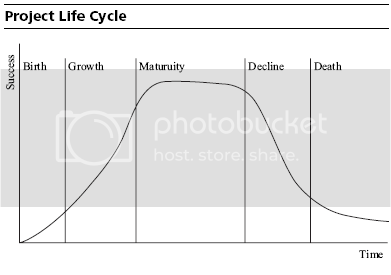 There is really no doubt that all projects eventually will find themselves in the decline phase of below graphic. Predicting when this will occur and planning appropriate actions for when it does can be time-and money-saving. An important part of the follow-up step is the prediction of discontinuance or normal termination dates for the project. This allows for the timely introduction of proposals for the replacement project. Capital budgeting is cyclical, allowing you to control growth on a continuous basis. The follow-up stage naturally reverts back to proposal generation as each project approaches termination.